This is a second edition of the highly popular volume used by clinicians and students in the assessment and intervention of aphasia. It provides both a theoretical and practical reference to cognitive neuropsychological approaches for speech-language pathologists and therapists working with people with aphasia. 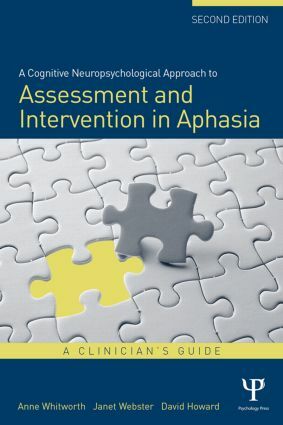 Having evolved from the activity of a group of clinicians working with aphasia, it interprets the theoretical literature as it relates to aphasia, identifying available assessments and published intervention studies, and draws together a complex literature for the practicing clinician. The opening section of the book outlines the cognitive neuropsychological approach, and explains how it can be applied to assessment and interpretation of language processing impairments. Part 2 describes the deficits which can arise from impairments at different stages of language processing, and also provides an accessible guide to the use of assessment tools in identifying underlying impairments. The final part of the book provides systematic summaries of therapies reported in the literature, followed by a comprehensive synopsis of the current themes and issues confronting clinicians when drawing on cognitive neuropsychological theory in planning and evaluating intervention. This new edition has been updated and expanded to include the assessment and treatment of verbs as well as nouns, presenting recently published assessments and intervention studies. It also includes a principled discussion on how to conduct robust evaluations of intervention within the clinical and research settings. The book has been written by clinicians with hands-on experience. Like its predecessor, it will remain an invaluable resource for clinicians and students of speech-language pathology and related disciplines, in working with people with aphasia.